The stock fell almost 10 percent after its latest earnings reports. The markets did not like the results. Earnings down. Same-store sales down. Margins down. The market threw up over it. That being said it, I feel context is always required. The company is still generating strong profit. The problem with Big Lots is it has never been a high margin, growth business, but Wall Street treats it as such. Earnings are down right now, however long-term this company and its management team have demonstrated a competency for generating consistent wealth creation. Many will say Amazon is eating them up, but as I’ve said in previous videos and blog posts, people that shop at Big Lots don’t shop on Amazon because many don’t have consistent high-speed internet access. It’s easier to go to a physical store. With the stock down 10 percent, I decided to buy more shares to lower my cost base which as fallen from $44.50 to now $40.93. Sure enough, since I made the move, the stock has woken up a bit and is now trading in the $43 level and so thanks to this additional purchase, I am right now in a tiny profit position. The stock went down to the $50 level so I decided to buy more shares to lower my cost base from $56 to $53.41. Nothing fundamentally has changed with the company. It’s still on track to expand service to Hawaii and challenge the Hawaiian Airlines monopoly. 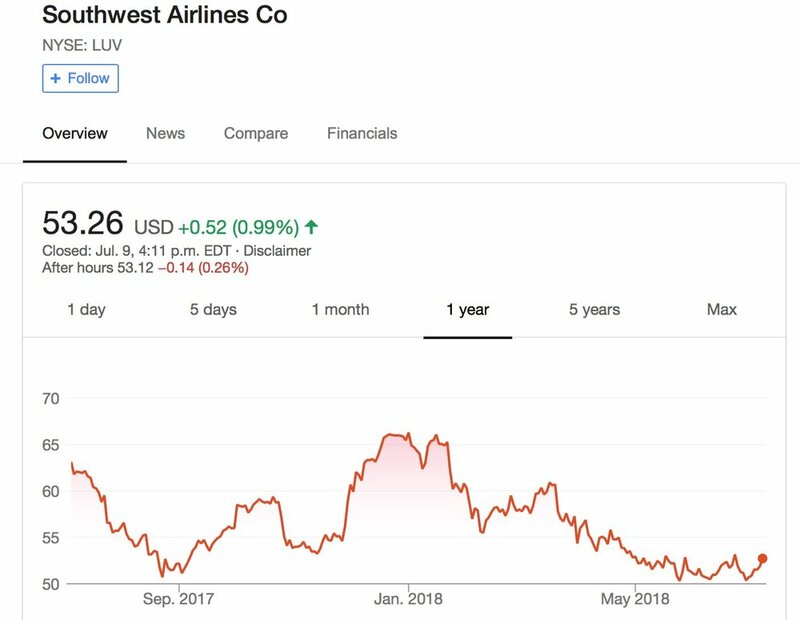 What also could help Southwest is oil prices were at one point tracking down and even though they have hedging strategies to manage their fuel costs, it is still a good thing for their profitability. The stock crossed my 20 percent return threshold so I had to make a decision on whether to hold on or sell. On a US dollar basis, the return was 25.9 percent. Stock hasn’t been doing much even though the company has continued to fire on all cylinders. It has faced headwinds (mostly from analysts) because of Amazon and has kept the stock discounted. Finally it appeared that investors are paying attention to what has been a great story. 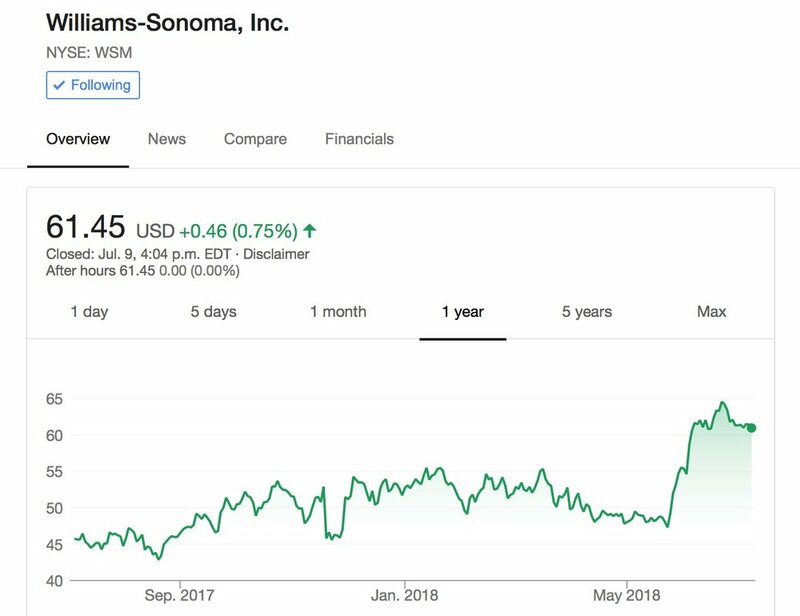 WSM is more of a e-commerce play than a physical store play with more than half of its sales coming online. They have differentiated themselves on service and more focus on the personal nature when in store and has complimented it with a strong online workflow. Now that it has moved I thought maybe let it ride now. I think one of my flaws or challenges I have is that I sell too fast and not let stocks run further. I’ve tried to resist the urge. I guess it comes down to staying true to my playbook and executing my investing playbook, knowing that over the long term, I’ll be further ahead by consistently following. So I sold. After going as low as $214, stock surged quickly past $270 and add in a rising US$, my return quickly shot past my 20 percent return threshold. On an apples to apples basis my return was 19.6 percent so the stronger US dollar gave me a few more percentage points as bonus. I still like the company and I think it is a player in the whole Artificial Intelligence field especially in China. I just thought the stock moved so far so fast that it would be good to bank some profits here. Baidu is a pretty volatile, stock so it can easily go back to the low $200’s and I’d rather stay on the sidelines and wait it out. It can just as easily hit $400. Sure enough, after I sold it, the stock plummeted back to the $240 level as the COO, who has been a driving force behind the pivot to AI technologies and self-driving vehicles, left the company citing health reasons. I think the response was too much and really not justified. If it does take the stock down to the low $200's, I may be willing to jump back in. Long-time readers of my blog will know that for the most part my portfolios skew towards owning US stocks and assets as I believe there are a greater variety of high quality businesses that span across a diverse set of industries. The problem being a Canadian is by owning US$ assets and paying with Canadian dollars, I am exposing my portfolios to some serious currency risk. If the US$ falls then the value of my portfolio falls even though the stocks may be rising in price. Not ideal and kind of annoying for me to see investments decisions that pan well and generate strong US$ based returns get eroded because of currency fluctuations. I’ve always been trying to reduce the currency risk. In the past there were ETF products that could allow you to hedge your exposure but at least in Canada they don’t exist anymore. So I’ve been trying to find a low cost alternative to hedging. The best I could come up with it is to take advantage of the inverse relationship with the US$ and commodity prices, specifically gold. As the US$ falls then the price of gold will eventually rise over the medium to long term. It was this dynamic that led me to try out buying a Gold ETF that is currency unhedged. The CGL seemed to fit the bill. The logic was if the US$ were to fall then the value of my US$ stocks and ETF’s would fall, however that fall would offset a bit by a rise in Gold ETF. In 2016 as the US$ was falling pretty hard, I decided to buy some CGL to hedge about ½ my US$ stocks position. Sure enough gold prices started to rise as the US$ fell and so the CGL rose and dampened the effect of the erosion of my US stocks. As the Federal Reserve started to systematically increase interest rates in 2016 and 2017, I thought that the US$ would start rise again and so the need to own the CGL to hedge my US$ risk was less so over the course of 2017 I started to slowly reduce my CGL holdings to where I had a very small position. Now with the US$ firmly rising due to continued interest rate hikes, coupled with a certain flight to quality mentality with currency investors, I didn’t think it made sense to continue having this Gold ETF. With that I decided to sell. I basically broke even on the position, but I think it was a useful exercise, only for my piece of mind knowing that I had some protection for my US$ and I was able to preserve some of that value. My approach is very, very back of the envelope. I wouldn’t tell someone to do this because this approach will open up a lot of exposure to see-sawing value changes and so it is not for the faint of heart. I do it because I just don’t like losing money especially on decisions when all things are equal appear to be good ones! I just sleep better doing this. There are other schools of thought regarding currency hedging in terms of not even bothering because over the long term the volatility washes out and I think that is very reasonable and when I do hedge, I only do it on part of my portfolio as I still want to enjoy any upside gains if the currency goes the other way. That’s what hedging is all about, managing risk. At the end we all view risk differently. I feel better knowing part of my portfolio is somewhat protected. Starbucks stock was getting crushed the last few months. Weak forecasts, some not so great PR events started taking the stock down. It got me interested to see if it may be worth picking up as it seems to be out of favour by Wall Street. Here's my mind map video that walks through my though process that led me to buy shares in Starbucks.